Frankfurt, located in the federal state of Hesse, lies in the heart of central Germany. The city is the financial hub of Europe, the site of the a major international airport, and home to the German Stock Exchange and the European Central Bank, leading to the nickname "Bankfurt". Thanks to its modern skyscrapers and the river Main, which runs through Frankfurt’s center, the city is also nicknamed "Main-hattan". With 660,000 inhabitants, Frankfurt is Germany's 5th largest city and the first look at Germany for many visitors. Frankfurt is a city of contrasts. People are both fiercely proud of their traditions and history and completely adaptable to their ever-changing way of life. 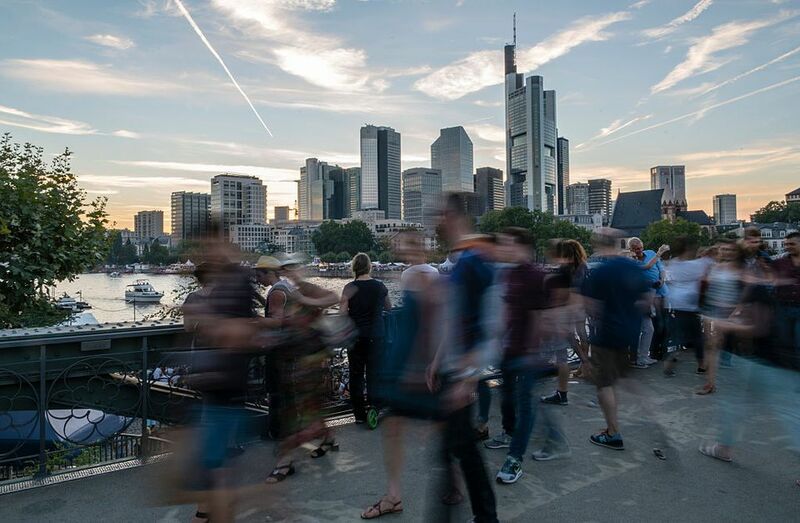 It is famous for its futuristic skyline and financial district, but Frankfurt is also home to historic squares with cobblestone streets, half-timbered houses and traditional apple wine bars. Start at the Römer in the re-constructed Altstadt (old city). This medieval building is one of the city's most important landmarks. The city’s most prominent son was Johann Wolfgang Goethe (1749-1832), Germany's most important writer. He is revered and remembered with the Goethe House and Goethe Museum. Take a deep breath in Frankfurt’s calming Palmengarten. Founded in 1868, it includes 50 acres and more than 6,000 different botanical species from all around the world. If you're worried about your basic German skills, rest assured that nearly everyone in this international city is comfortable speaking English. Frankfurt's international audience means the city has stepped up its game and offers both homey German specialties and the latest in haute cuisine in its many restaurants. Frankfurt has no shortage of traditional German restaurants and wine pubs (especially in the district of Sachsenhausen). If you want to get a real taste of Frankfurt, look out for the famous Frankfurter Grüne Sosse, a rich green sauce made with a variety of herbs. Or try the challenging Handkäs mit Musik (handcheese with music), a distinctive sour cheese marinated with oil and onions. Wash it all down with some Apfelwein (apple wine), called Ebbelwoi in the local dialect. You can even take the Ebbelwei Express, a historic tram, to eat and drink on a tour of the city. The premier place to shop in Frankfurt is the shopping street called Zeil, known as "The Fifth Avenue" of Germany. This shopping street offers everything from chic boutiques to international department chains for the discerning shopper. If you visit Germany during Christmas (from late November to just after January 1st), you must visit one of the city's many Weihnachtsmärkte (Christmas markets). Frankfurt is a major transportation hub in Germany with its busiest airport, many autobahns and German railways intersecting, the city makes a great starting point for your Germany travels. Frankfurt International Airport is Germany's most frequented airport and the second busiest airport in Europe, after London Heathrow. Located approximately 7 miles southwest from the city center, the airport is well connected. All major car rentals are available here, or you can simply take the public transport lines S8 and S9 to Frankfurt's Hauptbahnhof (central train station) which takes approximately 10 minutes. Take a regional or long-distance train to reach almost any city in Germany as well as many European destinations. Frankfurt has three major train stations, the Central Station in the heart of the city, the South Station, and the Airport Train Station. The best way to get around in Frankfurt is by public transportation. Operated by RMV, The city has a very well developed and modern public transportation system, consisting of trams, subways, buses. Frankfurt is an international destination with many travelers arriving for business or pleasure. There are hotels at every price point from discounters in the red light district to luxury business travel. Frankfurt hosts many international trade shows, such as the annual Frankfurt Book Fair in fall or the Frankfurt Auto Show every two years in summer. This can limit the amount of accommodation available and the price. If you plan to travel to Frankfurt during a trade show, make sure to reserve your hotel room early and be prepared for higher rates.